IMG is specially formulated to provide maximum, long lasting protection to bearings, bushings, sliding surfaces and other areas exposed to severe conditions of pounding, heat, moisture , or heavy loading. IMG is excellent in applications where there is a need to provide extended component life while reducing excessive grease consumption. Special additive technology and highly refined petroleum oils give IMG excellent oxidative and thermal stability, and high film strength under extreme pressure conditions. A proprietary calcium sulfonate complex base provides high dropping point, mechanical stability, and extremely low oil bleed characteristics ensuring protection at high temperatures and high radial forces. IMG has exceptional resistance to water washout and corrosion. IMG is ideal where hot and cold, low and high-speed bearings must share the same lubricant. It is extremely effective for wet and hot end use for roll neck journal bearings found in paper and steel mill operations. IMG is excellent for use in heavily loaded hinge pins, splines, CV and universal joints, rolling mills, slabbing mills and many other uses. 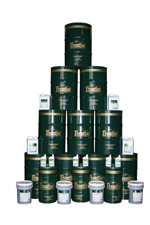 …and many other areas requiring the use of a superior extreme pressure grease for extended service. 4 Ball Wear, Scar Dia.